FILE - Palden Gyatso is guided as he casts his vote to elect a sikyong (prime minister) of the Central Tibetan Administration and lawmakers in McLeod Ganj, India, March 20, 2016. The Tibetan monk died Nov. 30, 2018, in Dharamsala, India, at age 85. Treated like a plow animal, kicked, beaten and tortured with leather belts, electric cattle prods, iron bars, self-tightening handcuffs and thumb screws, Palden Gyatso, a Tibetan monk, survived more than three decades in Chinese prisons. He fled to India in 1992, smuggling out some of the devices used to torture him. He quickly became one of the most high-profile critics of Chinese human rights abuses, speaking to audiences around the world about China's policies in Tibet. He died Friday morning in Delek Hospital in Dharamsala, India, home to the Tibetan government in exile. He was 85 and had been diagnosed with liver cancer several months ago. At his death, Palden Gyatso was surrounded by monks from the Kirti Monastery, where he had been tended, monastery spokesman Losang Yeshe told the Tibetan Sun. 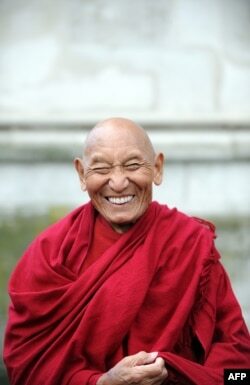 Palden Gyatso was born in Panam in central Tibet and became a monk when he was 10 years old at Gadong Monastery. He became fully ordained at 18, just when China invaded Tibet in 1950, 37 years after it asserted independence. In 1959, when China crushed the Tibetan uprising against its occupation and the government with the Dalai Lama fled into exile, Palden Gyatso was arrested along with thousands of other monks, accused of being a reactionary and sentenced to a seven-year prison term. FILE - Tibetan Buddhist monk Palden Gyatso attends a wreath-laying ceremony at the Memorial to Innocent Victims, outside Westminster Abbey in London, March 10, 2009. Palden Gyatso escaped from prison three years later but was caught at the Indian border and imprisoned again with leg shackles that were not removed for more than two years. He completed his prison term in 1975 but was sent to a labor camp for prisoners. He escaped again in 1979 but was soon caught putting up anti-Chinese posters and sentenced to another nine years in prison. On Aug. 25, 1992, he finished his prison term; 13 days later, he escaped from Tibet to India, where he found asylum. After undergoing rehabilitation in Dharmsala, Palden Gyatso traveled extensively and testified before many government bodies, numerous human rights organizations, universities and news organizations. In speaking about his prison experiences, Palden often described how he lost all his teeth because guards rammed electric prods into his mouth. In a kind of show-and-tell presentation, he often brought along torture equipment similar to items used on him. In 1995, Palden Gyatso testified before a U.S. House subcommittee on human rights. "We prisoners were yoked to plows like animals to till prison land. When we got exhausted, we were kicked and whipped from behind," he said, according to a New York Times report on his testimony. "Since we were never given enough to eat, we were forced to steal food meant for the pigs from the Chinese pigsties. We were also driven to chewing and eating all kinds of used leather items, bones of different kinds of dead animals, mice, worms, grasses." 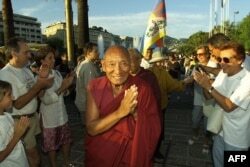 FILE - Tibetan monk Palden Gyatso, a political prisoner for decades in China, makes a gesture of prayer, July 9, 2000, in Nice, France, to a crowd that came to show support for him. As a political prisoner, he endured torture refined to the season. Winter meant being suspended above the ground and doused with icy water. Summer meant fires burned on the ground below. Year-round, suspended by self-tightening handcuffs and thumb screws, the prisoners endured beatings with leather belts, electric cattle prods or iron bars. His book, The Autobiography of a Tibetan Monk, was published in 1997. In 2008, Japanese filmmaker Makoto Sasa made a documentary, Fire Under the Snow, about Palden Gyatso, after reading his autobiography. "Seeing him smile tenderly with hands joined in prayer, I struggled to reconcile this warm presence with the bitter life recounted in the book," she says on the film's website. "I tried to imagine how a return to relative normalcy was even possible after spending more than half his life under nightmare conditions. How could he still smile with such compassion?" Although "humble" about his own experiences, his "reminiscences about friends starved or tortured to death, driven to suicide or still in prison, caused him to break down into heart-rending sobs: this is a legacy of pain beyond pain," Sasa added.